Guaranteed to provide hours of fun and enjoyment for your little one. Lily’s large footprint and tunnel will allow several children to play inside along with their toys. Her cute face and demeanor will make her a favorite place to play. The main tent sets up with 3 shock corded fiberglass poles and pole pockets. The tunnel is supported by a wrapped steel spring which is encased in a nylon sleeve. The tunnel connects to the tent using four easy to use loop and toggle attachments. A large inverted T door which zips down the center provides a large opening and along with the mesh vent in the back wall provides plenty of ventilation. 170T 450mm coated Polyester for the walls and Tunnel and a durable waterproof coated polyester floor on the tent means easy care and a long life for this play tent. 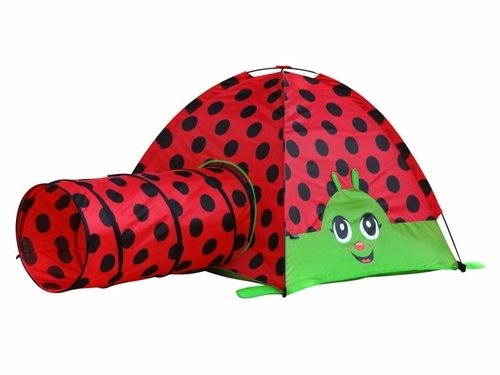 Lily the Ladybug has a 50”x50” floor size to allow several children inside with their toys. A 40” center height means more interior play space. This tents free-standing design allows the tent to be used inside or outside for fun anywhere.